I felt it was about time we had a master list of all the WINNERS of previous Horny's Chosen tournaments. These guilds worked hard as a team to win their golden ring(s) & it's only right that they be recognized for their bravery to even compete and of course their success at being victorious in this tremendous challenge. ***Just click on the guild names above to jump to the corresponding post in this thread with information about their tournament. Congratulations to ALL the guilds on the above list. Winning a Horny's Chosen tournament is indeed one of the hardest challenges you can take on in this game. Enjoy your rings & welcome to the most exclusive club in this game. AUTHOR'S NOTES: It is my hope to record a complete & accurate accounting of each tournament in question. As I am only one individual however, with only my own personally experiences in these tournaments I am sure to miss some stories that others may wish to have recorded. Please PM me if you find any corrections that need to be made or if you have any additional content you feel is missing. Last edited by Da Grud on Tue Mar 10, 2015 4:13 pm, edited 28 times in total. Tournament Notes: This was the first and longest tournament of them all. 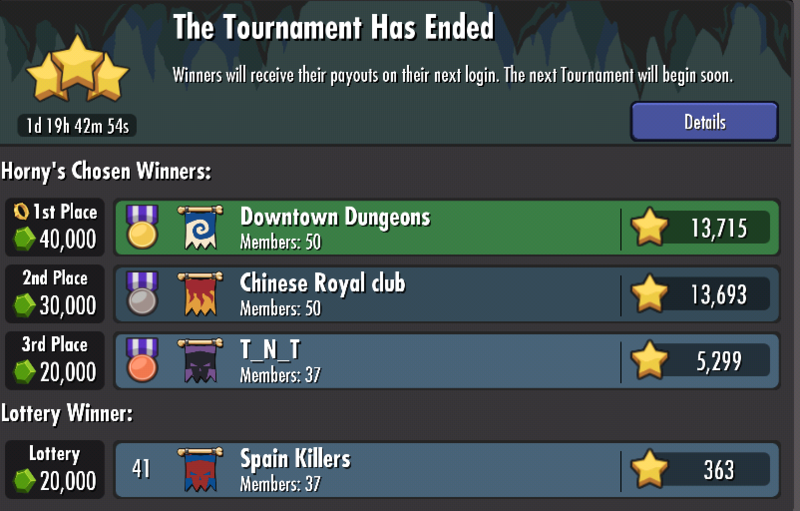 The entire DK community was excited to take their shot at winning the FIRST ever tournament in DK Land. The predominate strategy used during this tourney was know as the "Tiny-By." Keepers would send in the highly over-powered Tiny immortal (sometimes paired with the disable trap spell), make a beeline to the heart & get an easy win. This was the last great hooray for Tiny tho, as it was greatly nerfed at the conclusion of this contest (<source thread>). Many were excited to compete, but In the end it turned into a battle between two guilds; 'Downtown Dungeons' and 'EA还我们宝石' (translation: EA Give us back our gems). Downtown Dungeons took the early lead and held it for a few days, but EA还我们宝石 kept the pressure on & slowly, but surly took the eventual lead & win. ***I could provide more in depth info here, but the update thread of this particular tournament is very concise so I feel no need to repeat it here. Tournament Notes: whereas in the first tournament everyone was super excited to compete, in this tournament guilds seemed to be very hesitant. Subject: How long did it take your guild? 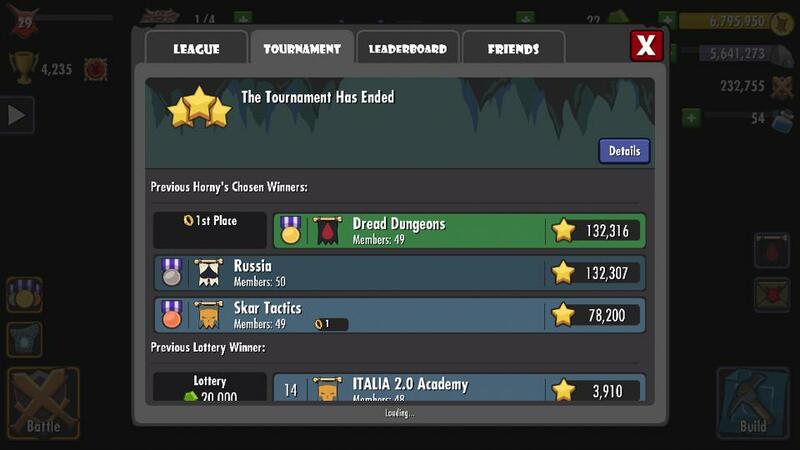 Da Grud wrote: Almost 6 hours in & still only 3 guilds qualified for the tournaments... I'm convinced guilds are holding back to avoid the top bracket now. 250 stars is nothing! That's just 5 stars per keeper in a guild. sodomine wrote: 2/3 elite players in Tournament 1 quit the game. CRC and CHN EA may be described as an empty city(guild). If the first tournament was defined by the "Tiny-by" method, this one saw the birth of the "Baby Dungeon" method. This method entailed building a new, low level dungeon that had high offense ability, but a very low DCR. This was achieved by not building or upgrading anything that didn't help offense & keeping the dungeons trophy score low. Da Grud was the first player to use a lower level dungeon to quickly earn stars during the qualifier. Others in his guild (Downtown Dungeons) saw the impressive numbers he was able to put up & many scrambled to create new "baby dungeons" of their own. In the end this tournament became a battle of the old "Tiny-by" method against the new "Baby Dungeon" method. The members of EA还我们宝石 that hadn't quit because of the Tiny nerf, joined forces with The Chinese Royal Club & again it came down to a two guild fight between the Chinese & Downtown Dungeons. The China guild didn't catch on to the new "Baby Dungeon" method until too late in the game & even tho they quickly scrambled to create their own baby dungeons, in the end Downtown Dungeons pulled out the narrowest of victories by a margin of only 22 stars. Last edited by Da Grud on Thu Sep 04, 2014 8:09 am, edited 2 times in total. Tournament Notes: This tournament qualifier started just 2 days after the end of tournament 2. Because of this fact, it found record low participation & lower star totals than the previous tournaments. 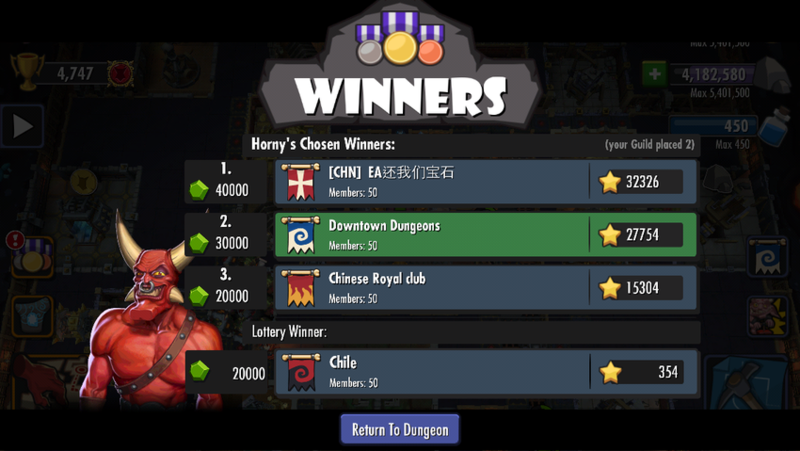 The Chinese guilds did not compete this time round so it was an easy win for Downtown Dungeons. They earned their second ring & became the first guild to win Horny's Chosen tournament twice despite the Italy guild's attempt to rally support and beat them here. 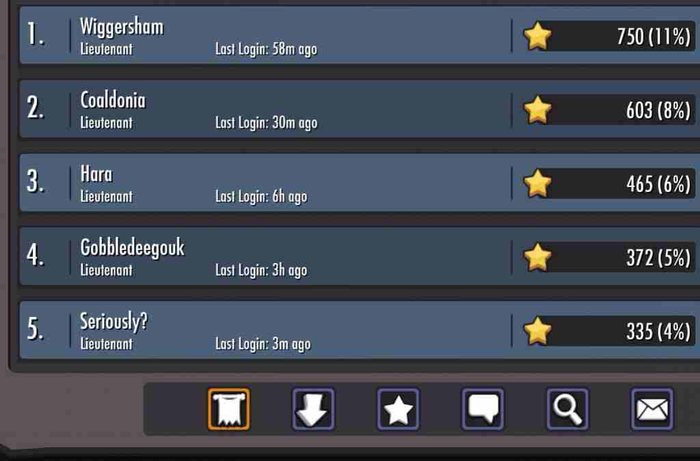 In a nut shell, people wondered if Frog France had kicked members that had contributed stars in order to boost the gem rewards of others in the guild or if they had just used multiple accounts which they had exit the guild when they saw they didn't need their stars. In the end, no one came out to complain about being booted so it was believed that the star drop was caused by them removing second accounts of theirs. Last edited by Da Grud on Fri Sep 05, 2014 5:06 pm, edited 2 times in total. Tournament Notes: This was an interesting tournament indeed. It started off with the qualifier where spcbrass decided to compete in the Horny's Chosen bracket as a solo player (<source thread>). As for the two time winning guild, Downtown Dungeons, many in that guild decided to try and help a small low level guild known as Studio Ghibli. This splitting up of Downtown Dungeons' members helped allow Brothers Guild to win their first ring. This act caused many others to leave his guild and dropped Studio Ghibli from second place to third. It also lead to the biggest fight/debate in these forums I have seen to date. There were more threads locked after this event than at any other time to date. ***I was unable to find a breakdown of Brother Guilds numbers. If you have one please send link to me via PM & I will include here. Last edited by Da Grud on Sun Nov 16, 2014 4:50 pm, edited 2 times in total. 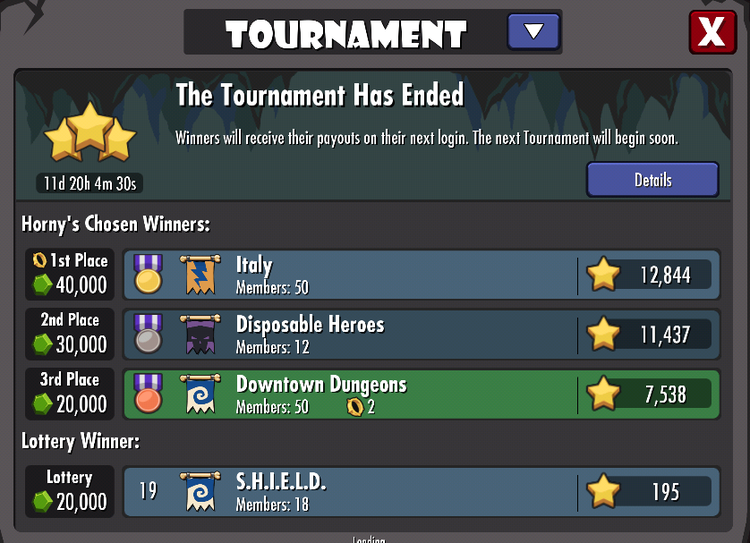 Anyways, once the tournament started it appeared it was going to be a "battle of three countries" as Italy, Frog France & Downtown Dungeons topped the winners list. However, it wasn't meant to be as a brand new, unknown guild, 'Disposable Heores' appeared out of nowhere and started to climb the leaderboard. The guild showed only 12 players in it and was only a level one guild. No one knew who they were, but it appeared they may have been cheating somehow in an attempt to win the tournament. 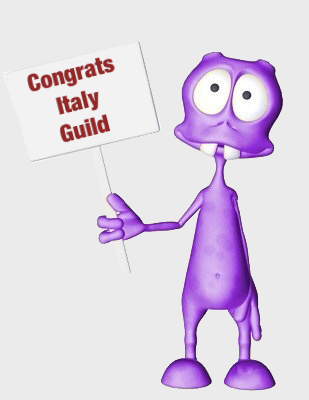 Despite the possible unethical practices that Disposable Heroes may have been using, the Italy guild was still powerful enough to win it's first ring. Quite an impressive win if you ask me. Tournament Notes: This was the first tournament to follow the change to the star award system. As such, keepers at dread level with a level 10 dungeon heart were now able to earn as much as 43 stars at a time for a single three star victory. Because of this fact it was indeed odd that the qualifier for this tournament remained at only 50 stars. All the brackets for this tournament filled up in less than 2 hours. Considering the qualifier started in the middle of the night for some in European time zones, this meant some guilds missed their opportunity to even qualify for this tournament. Subject: QUALIFICATION CRITERIA FOR TOURNAMENT 6. MWyatt_Mythic wrote: It was an intentional choice to not raise the qualifications for this tournament considering that the only means to message the server-side change was via the forums and other social channels. Increasing the qualifying stars have the very real possibility to turn other players away from the competition without having full knowledge of the situation. It will be revisited for the next tournament as natural word of mouth will spread the actual changes. Other than a little controversy surrounding the qualifier of this tournament, the rest of it went off without much drama. Downtown Dungeons joined forces with Brotherhood guild to try and help them win their first ring & also to pay them back for their helping Downtown Dungeons win bronze in tournament 5. However, Brotherhood guild was so organized & it's members did such a great job earning stars that they probably still would have won even without Downtown's help. In the end, they smashed first place by earning over 100k stars (double the second place guild's total). I'm guessing the 75% reduction in minion summoning time promo didn't hurt either. Tournament Notes: This tournament could have ended completly differently. Many in Downtown Dungeons were moving on from this game and as such those that remained started looking for a new guild to compete in. Brotherhood asked for Logan's Run's help in recruiting some of the Downtown Dungeon keepers over to their guild. Logan recruited Da Core (aka Killalot & Killalittle), but Da Core wanted to bring both his main account and his baby dungeon over. Brotherhood told him he couldn't & this upset Logan who had been planning to fight with Brotherhood (against his bud, Shimmerwitz) & instead they both joined Skar Tactics and fought against Brotherhood1. 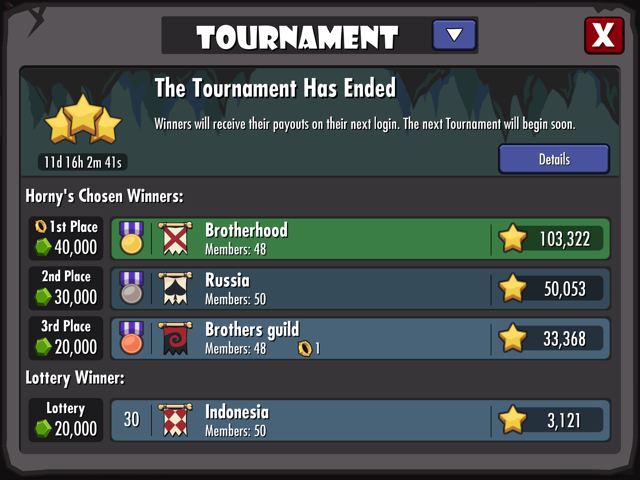 In the end, this tournament was a battle between three guilds; Brotherhood, Russia & Skar Tactics. All guilds involved put up some impressive numbers considering the lack of a reduced minion summoning time promo. They should all be proud of their performances, but Skar Tactic ended up the winner by a margin of over 14,000 stars. Logan's Run, however had earned 14,000 of those stars himself. Had he fought with Brotherhood like he had originally planned, we might indeed have had a different winner to this tournament. 1-The information sited in this part of the history came from Logan's Run himself. Last edited by Da Grud on Mon Sep 08, 2014 5:10 pm, edited 7 times in total. Tournament Notes: This has got to have been one of the most exciting tournaments yet. There were three players in this fight, Dread Dungeons, Skar Tactics & Russia. The lead changed several times early on in this fight until Dread Dungeon started to pull ahead after being joined with some new top star earners. Russia didn't give up tho. They continued to fight hard up until the last seconds of the match to give us the closest victory ever between first & second place—a mere 9 star difference. 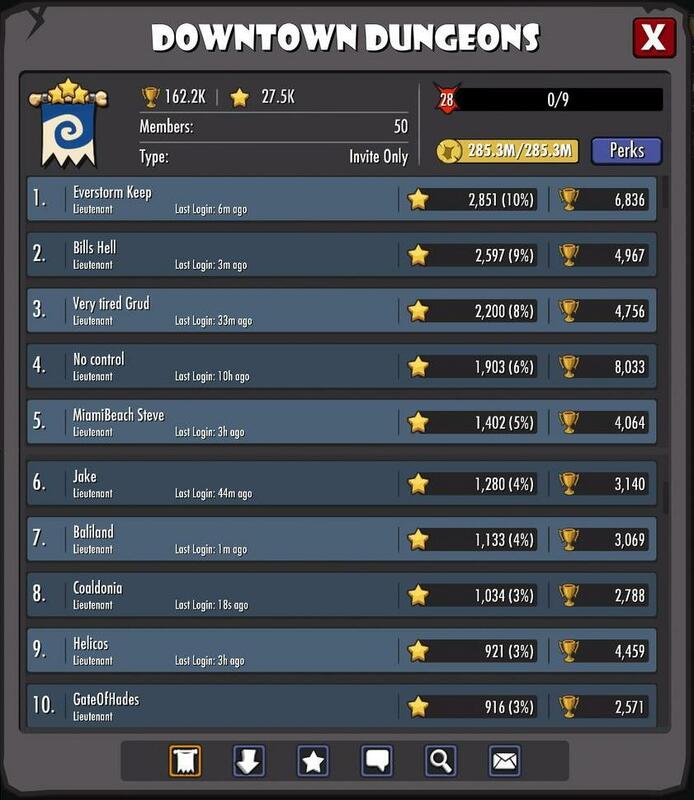 Even more impressive considering most members of each guild win anywhere from 21 to 43 stars per victory. There was a minor scandal at the conclusion of this tournament as some people objected to the fact that Dread Dungeons had others join it mid tournament. I think what they ignore is the fact that Russia guild did as well. Last edited by Da Grud on Thu Sep 04, 2014 12:59 am, edited 2 times in total. Tournament Notes: This tournament qualifier started just 2 days after the end of tournament 8. So just like tournament 3, many keepers chose to sit this one out. As such, Skar Tactics found there way to any easy victory and won their second golden ring. Making them the second team to accomplish this goal & more than likely, soon to be the first guild to win three rings. There was a small ruckus during the middle of this tournament when an unannounced hot fix was pushed through that caused many to NOT be able to play the game for some hours. (<source thread>) Other than this tho, the tournament was fairly uneventful.